Chinatown’s place in history is assured. The passage of time has not diminished it’s greatness. 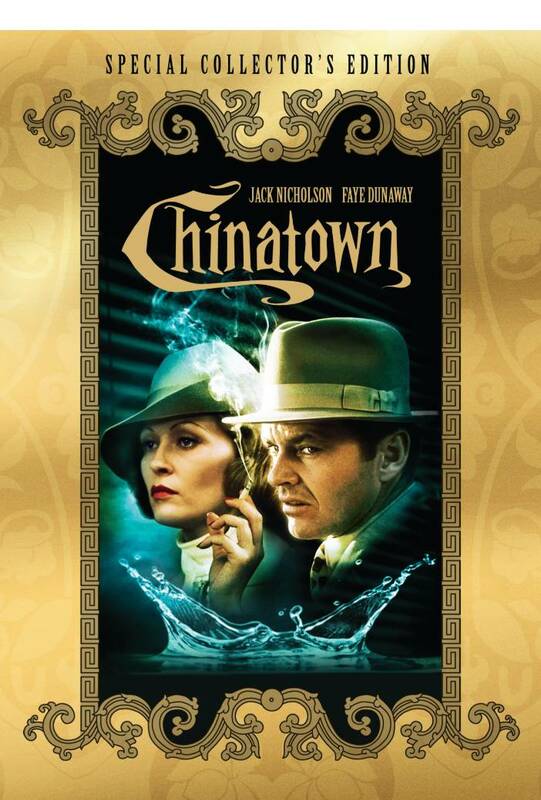 Set in the 1930s, Chinatown is a story of power and the dark influence it can have on men. Jack Nicholson is Jake Gittes, a former cop turned private detective. Gittes is good, his skills fall just short of his ego. After being made the fool, Gittes puts all of his energy into finding out who was behind a scheme in which he was made a pawn. After being tricked into discrediting her husband, Evelyn Mulwray (Faye Dunaway) hires Gittes to find out who was behind the scheme to ruin her husband’s reputation. Gittes uncovers a plan to privatize the ownership of water and thus make millions off the drought that is currently wrecking havoc on L.A. county. The trail leads to Dunaway’s father (John Huston in a brilliant performance) and gives us one of the most memorable endings in cinematic history. Chinatown’s excellence is not limited to just one thing; the story, the cinematography, the score, the acting…all hit the mark. The Gittes character is a fascinating one. His flaws are evident (His past failings haunt him, he clearly has racial prejudices and is not as clever as he thinks he is) and Jack (as all of us close personal friends call him) takes these aspects and uses them to create a character that steps beyond the usual prototypical noir/hardboiled protagonist archetype. From a technical stand point; this disc is a definite step up from the previous Chinatown DVD. The picture is sharper and that alone would make it worthwhile to purchase. But the icing on the cake is an excellent documentary. This four-parter features Jack Nicholson, Roman Polanski, writer Robert Towne and producer Robert Evans. Each gives their own insight into not only the making of the film, but their thoughts on it now and its place in cinematic history. Polanski and Towne each discuss the famous disputed ending. Polanksi wanted an ending darker and more tragic than what Towne had originally written. In the end, Polanski won out and delivered what has become a truly legendary finale to an already classic film. Towne now agrees that Polanski was right. Any fan of noir fiction or film needs to have Chinatown in their collection. No library can be considered complete without it. For more reviews from myself, and the rest of the Crimespree crew, check out the index of reviews. Thanks for this review, Jeremy. I have the 25th Anniversary Chinatown DVD, and now the Special Edition is going on my Christmas wishlist.